Our dedicated International Business team advises global technology and life sciences businesses, financial institutions and their advisors on internationalisation. The approach of our team is to look at the client through the prism of their business model and vision, and to provide them with the local knowledge, ideas and support necessary to facilitate their European international trade planning and execution. From initial planning and tax structuring through to your first hire and payroll compliance, from outsourced accounting and bookkeeping to the preparation of your annual financial statements in accordance with GAAP, our dedicated International Business Team provide the ideas, support and connectivity necessary to help Make Trade Happen. We are well connected in the international trade and financial services ecosystems. As a member of EisnerAmper Global, Allinial Global and Premier International Associates, we can provide European-wide compliance co-ordination. We work closely with industry leaders, entrepreneurs, service providers, trade bodies, Irish and international law firms and government bodies such as Enterprise Ireland and Industrial Development Authority (IDA) Ireland. Core to our approach to delivering value added services is the provision of initial advice, via meetings and conference calls, in a confidential and non-obligatory manner. We look at the reasons and motivators for internationalisation and compare our client’s plans to the Internationalisation Playbook that we have developed. Feedback from our clients indicates the provision of this advice is highly beneficial in enabling them to build a trusted working relationship and partnership with us. Our International Business team is made up of professionals with multidisciplinary and multinational backgrounds; people with life, global and industry experience who understand the execution of internationalisation and can help you grow your business. This team, combined with our unique approach and candour, enables EisnerAmper Ireland to provide you with the ideas, support and connectivity necessary to help Make Trade Happen. 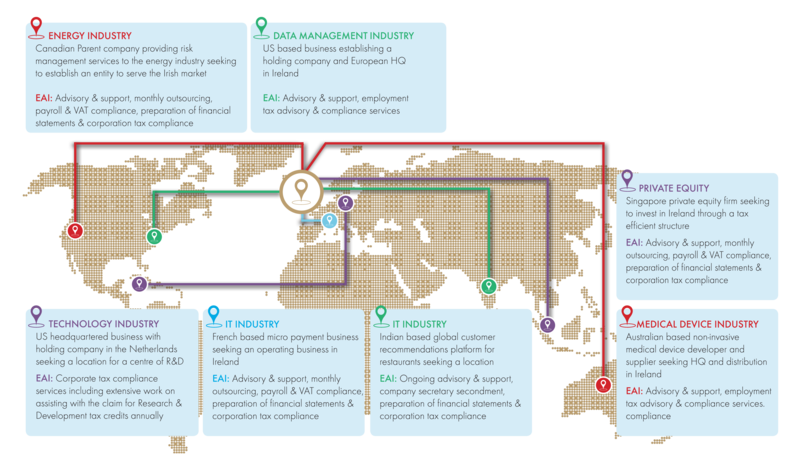 Ireland is home to many of the world’s largest multinationals, including those operating in the information technology, pharmaceutical, biotechnology and financial services sectors. These companies establish operations in Ireland to serve local, European and international markets, and in doing so leverage Ireland’s advantages as a gateway to these markets. Supportive legal and economic environment for internationally trading businesses. Ranked by Forbes Magazine as one of the best countries globally in which to do business, Ireland has a stable, efficient and advantageous tax regime. For companies in the IP & Tech sectors, there are additional fiscal incentives available including substantial Research & Development (“R&D”) tax credits in addition to R&D grants. We assist technology companies by assessing their future operations and determining the most efficient and appropriate tax and financial structures available to achieve their goals, while obtaining the maximum benefit of IP and R&D activities. The 2015 Prequin Global Private Equity & Venture Capital Report notes that European private equity funds continue to grow in spite of the European debt crisis and slow economic growth in recent years. Results for 2013 and 2014 indicate an increase in both the level of fundraising into, and the level of investments made by, European private equity funds when compared to previous years. We focus upon advising family offices, hedge funds, private equity funds and other alternative investment funds with their European capital raising and / or investment plans. We assist our clients with their set up, compliance and ongoing advisory needs. We also work closely with portfolio companies of these vehicles. With evolving and increasing regulation, we also work closely with other professional services providers (including the Big 4), providing conflict services and complimentary alternative services. Our private equity clients range from companies with direct investments in Sushi restaurants in Ireland, Japan and the US, to companies with direct investments in agrochemical businesses worldwide. 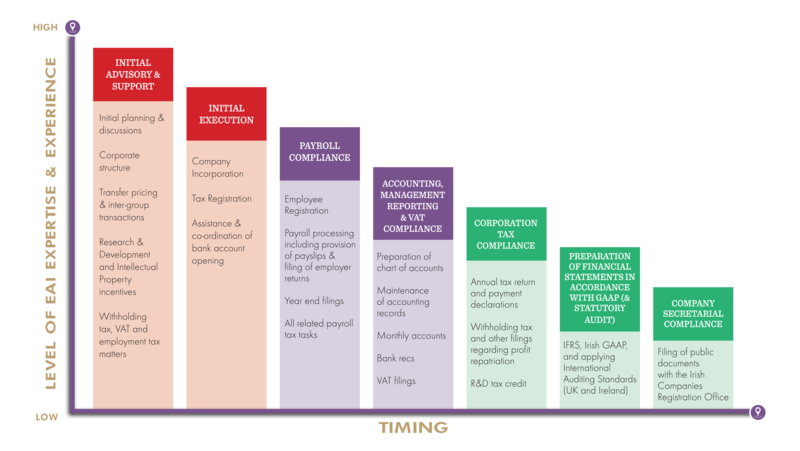 Our team specialises in assisting our clients with their compliance which includes the provision of monthly reporting services and uploading the monthly information onto their group reporting system, preparation of the annual statutory financial statements, filing the statutory financial statements with the relevant authorities e.g. Companies Registration Office (“CRO”) and compiling the consolidated pack for the annual board meetings. We also assist our clients with ongoing advisory needs which includes advising on financial planning, assisting the company with preparing cash flow projections and attending the annual board meetings. With 9 out of the top 10 global pharmaceutical companies and 8 out of the top 10 global medical device companies locating their European headquarters in Ireland, Ireland’s lifesciences & medtech sector is now established as one of the leading locations for researching and manufacturing medical device products globally. We assist lifesciences & medtech companies by understanding and assessing their future plans for their operations in Ireland and the requirements for achieving these plans. We do this by hosting a series of preliminary meetings and conference calls on a non-obligatory basis and by subsequently developing a unique and individually tailored execution plan. We provide the means for achieving these plans through the provision of initial advisory services (e.g. company structure, tax advice and profit repatriation advices), outsourced payroll and management reporting services and ensuring annual compliance for the company with the relevant authorities. With several of our clients operating in the manufacturing and distribution sectors, we have specialised expertise in providing accounting and ad hoc advisory services to companies with high-volume transactions and daily business activities that require a quick turn-around delivery. Our team assists a range of companies in a variety of product sectors, both global players with significant asset investment or specialty producers, providing insight and awareness to support clients to seize growth opportunities. We work closely with clients, providing a range of services from initial tax advisory and planning, to cash flow projections and budgets, and attendance at board meetings to comment on financial performance. Irish food and beverage exports totalled €10.5 bn in 2014; an increase of 5% on 2013. While F&B is a highly competitive market, new growth and product development opportunities exist for indigenous companies operating in this sector. Working with our colleagues in EisnerAmper LLP in the US, we assist Irish F&B companies expanding overseas and international F&B companies expanding existing operations into Ireland and Europe. We offer specifically designed management reporting and tax advice packages to assist companies in realising their business strategies using the most cost-efficient methods. Our clients in the food and beverage sector range from international restaurant franchises to niche brewers of craft alcohol products. The role of Global Head of International Trade is to provide global strategic leadership, communications and standards of excellence in the provision of professional services by members to international trade markets. In this role, Frank regularly visits all EisnerAmper Global member offices and their clients to keep abreast of international market forces, to foster collegiality and to ensure that member firms are meeting client service standards. Frank is also Head of EisnerAmper Ireland’s International Business market group. Frank assists companies with the execution of their internationalisation plans into, and out of, the European market. Frank’s work regularly takes him across the globe liaising with clients, trade bodies, professional advisors and government – to make trade happen.